The long-awaited Alibaba giant IPO (initial public offering) has been announced as China’s leading e-commerce company files documents in the US. Analysts predict possibly the largest IPO in global history. In March 2014, Alibaba had mentioned it planned an IPO in the US soon. In its filing at the Securities and Exchange Commission, Alibaba says it plans to raise $1 billion, but most Wall Street investors are talking of figures above $15 billion. It will have to raise more than $16 billion to beat Facebook’s listing in 2012. It will become the largest Chinese company to be listed in a US stock exchange. The filing contained no details on how many shares will be on offer or at what price range. Update, June 27, 2014: Alibaba has chosen the New York Stock Exchange for its initial public offering. It will be listed under the ticker “BABA”, which means “eight eight”. Eight is a lucky number in China. Update June 17, 2014: following criticism for lack of disclosure, Alibaba published updated earnings and sales data, as well as details on its leadership. While revenue and earnings have increased, profit margins have slipped. Alibaba giant IPO in US, but where? The company has not yet announced where in the United States it plans its initial public offering. The most likely venues will be either NASDAQ or the New York Stock Exchange. The Alibaba Group is a privately-owned Hangzhou-based company of online-based e-commerce businesses including online retail and payment services, business-to-business online web portals, a shopping search engine, and cloud computing services. 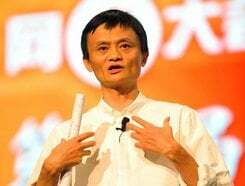 The company was founded in 1999 by Jack Ma (born Oct 1964), an Internet entrepreneur, who set up the web site Alibaba.com, a business portal originally designed to put Chinese manufacturers in touch with foreign buyers. Mr. Ma says he came up with the name in a San Francisco coffee shop. He wondered whether it might be a good name and asked the waitress who said she knew who Alibaba was, “Alibaba and the 40 thieves,” she said. He then went outside and asked about 30 people of different nationalities and confirmed that the name Alibaba is known worldwide. Mr. Ma explains that Alibaba was a kind and intelligent business person who had helped the village. The name is catchy and easy to spell. Mr. Ma was clearly thinking globally even at this point, otherwise, why would he be interested in a internationally-used name? From 1999 to 2000 Alibaba raised $25 million from SoftBank, Fidelity, Goldman Sachs and some other financial institutions. By December 2001 the company was making a profit. Taobao, the firm’s consumer e-commerce platform was formed in 2003. As part of a strategic partnership deal, Alibaba took over Yahoo’s operations of China Yahoo in 2005. It was successfully listed on the Hong Kong Stock Exchange in 2007. Alibaba’s filing today gives investors an idea of the company’s finances. Up to the end of December 2013, Alibaba generated revenues of 40.5 billion yuan ($6.5 billion) and made a profit of $2.9 billion. In 2013, the company sold merchandise to the value of $248 billion, with over 11.3 billion orders placed. The Alibaba Group’s value of merchandise sold across its platforms in 2013 was worth more than the combined total of Amazon and eBay. It is responsible for 72% of all purchases made via mobile phones in China. Investors will be excited about the potential of the Alibaba giant IPO at a US stock exchange. Many wonder whether the company can replicate its amazing success in China on a global scale. If it can the company will become a massive worldwide e-commerce powerhouse. Softbank – 34.4% share. Masayoshi Son, CEO of Softbank, a Japanese telecom company, invested $20 million in 2000. Analysts value Softbank’s stake in Alibaba at more than $40 billion, depending on the company’s final pricing. Yahoo – 22.6% share. In 2005, Jerry Yang, Yahoo’s co-founder and CEO at the time, made a $1 billion investment which gained 40% ownership of Alibaba. In 2013 Yahoo sold nearly half its stake back to Alibaba for $7.1 billion. Softbank was once a major shareholder of Yahoo. Yahoo’s remaining stake is estimated to be worth about $27 billion. As soon as Alibaba goes public Yahoo has to sell part of its stake, at which point Jackie Reses, Yahoo’s current representative on Alibaba’s board, will step down. Many say Yahoo’s fortunes have been saved by Alibaba’s surging revenues. Jack Ma – 8.9% share. Mr. Ma was an English language teacher before becoming an Internet tycoon. He founded Alibaba. He is today one of the richest people in China thanks to his stake in the company. In 2013 he stepped down as CEO to concentrate on China’s environmental problems. Joseph Tsai – 3.6% share. Tsai is Alibaba’s executive vice-chairman. He was a member of the original founding team. Other shareholders include Temasek (Singapore), DST (Russia), Silver Lake (Silicon Valley, US), Yunfeng Capital (China). The IPO comes just one year after US-traded Chinese Internet stocks recovered from an extended slump caused by a series of accounting scandals and concerns regarding inadequate disclosure. With the IPO a few months away, Alibaba, which values itself at $109 billion and might gain a valuation as high as $250 billion, has time to explain more. Alibaba is one of the world’s most important e-commerce companies.